Mid Cal is proud to serve the families and businesses of Pleasanton, California. Whether you're moving down the street from your old home or across the entire country, we can make your move efficient, safe and stress-free -- guaranteed! As a long-time Pleasanton moving company and dedicated Bekins Van Lines agents, our staff of well-train and highly-motivated movers can even help you settle down overseas. Bekins, an industry-leading carrier, has a worldwide network consisting of hundreds of agencies, making worldwide moving easier, safer and faster than ever before. As a BBB-accredited business with an "A+" rating, we wouldn't have it any other way. For more information on our Modesto international moving company and the services we offer, call us today or fill out the Quick Quote form above for your no obligation estimate. Take a peek inside our state-of-the-art storage facilty with Google's 360 Virtual Tour. Take the tour now! Receive up to $50 off your move! 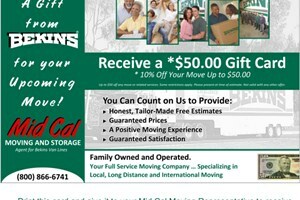 Print this card and give it to your Mid Cal Moving Representative to receive 10% off of your intrastate move, up to $50.00. The moving crew who arrived were very professional and prepared to do the job. The job was done quickly and without any problems. I will definitely use your company again. Thank you!